Below, we will explore how to create an election with the "Scored" voting method. Choose "Start with a blank question" on the window that pops up. Give the question a title by clicking into the title and deleting/typing text. In the section of the ballot question immediately below the title, change the voting method to "Scored". In the section below that, choose whether voters are voting on "Candidates", "Options", or "Other" (if you choose "Other", you will need to provide text for what the "Other" is). Add your candidates or options. Click the "+ Add Candidate" button to add more candidate/option fields. First, you must create a range that your voters will be scoring on. In the above example, we are using a range of 1 to 5, but you can use any range. Only whole numbers will be accepted. Negative numbers can be used for your range. The range must go from smallest to largest. Negative numbers can be used to create simple manual tallying of the results. For example, if using a scale of -1 to 1, where -1 is "No", 0 is "Don't know", and 1 is "Yes", the scores sum themselves. 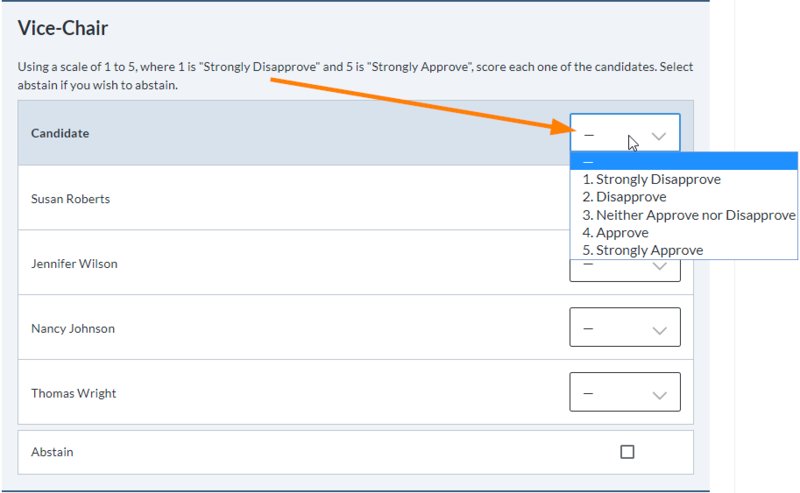 Any "No" scores take a point away from the candidate, "Don't know"s neither add a point nor take a point away from the candidate, and "Yes" scores will add a point to the candidate. Second, you must decide whether you want a winner to be decided by Electionbuddy. 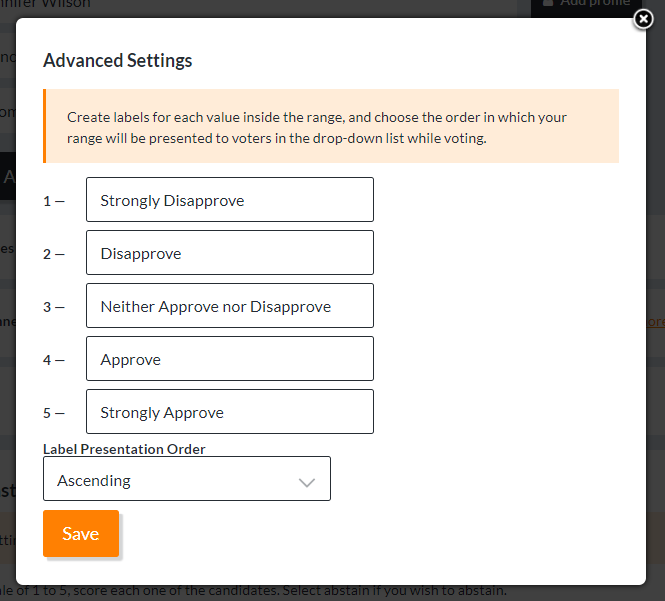 For Scored voting in an election, choose "Yes — from average score for each option". The winner will be decided by average scores; see the "Results" section below for more details. 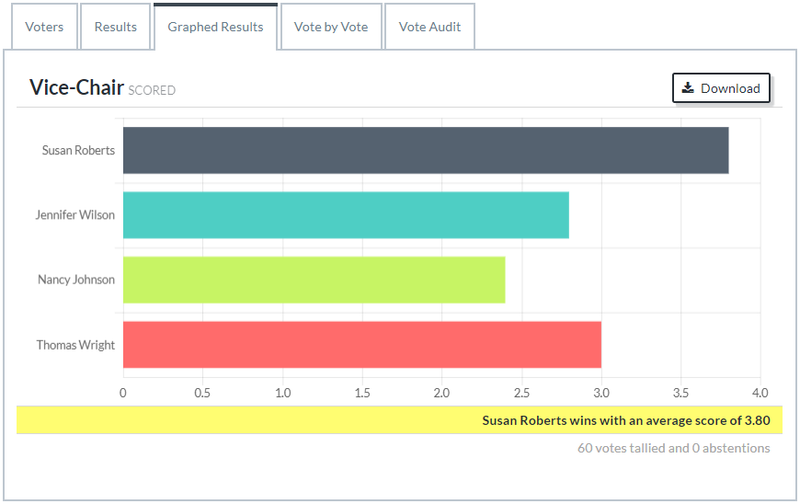 Weighting is compatible with Scored voting; weights will be reflected in the total scores. 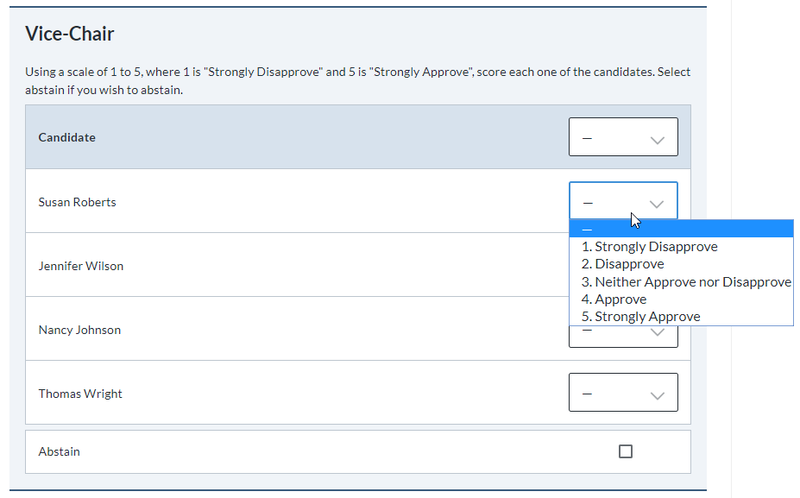 Taking a download of the results will provide you with everything for each candidate: the total score, the average score, and the score breakdown.